You can spread it directly onto your pastures, thereby returning its nutrients and minerals to your soil. You'll need a manure spreader, of course (they're not cheap), something to pull it with (an ATV for small spreaders, or a compact tractor for larger ones), and some way to load the manure into the spreader (as far as I'm concerned, that means a tractor with a front-end loader). Spread it very thinly (don't bury your grass), and don't apply during hot, dry weather. Fresh manure is a powerful nitrogen fertilizer, and when applied to water-stressed grass will just stress it even more, and maybe even kill it. Let the applied manure dry in the sun for about two weeks (to kill parasite eggs) before turning horses back into the pasture, and running a harrow rake over it first isn't a bad idea. It is a much milder fertilizer than is raw manure (lower nitrogen content, and its nitrogen is released more slowly to the soil), so it can be applied pretty much throughout the growing season. Composting reduces the manure's volume by one third to one half. Less volume, and less weight, means less labor and less storage space. Composted manure smells great, like potting soil. Your neighbors will thank you, and so will your horses (horses will graze happily in a pasture freshly spread with compost, but the same can't be said for raw manure). Even an active compost pile doesn't smell bad. Proper composting (maintaining a pile temperature between 135° and 150° F) will kill any parasite eggs, spores, larvae, insects or weed seeds in your manure, so you won't keep re-infecting your pastures. Compost won't draw or breed flies. 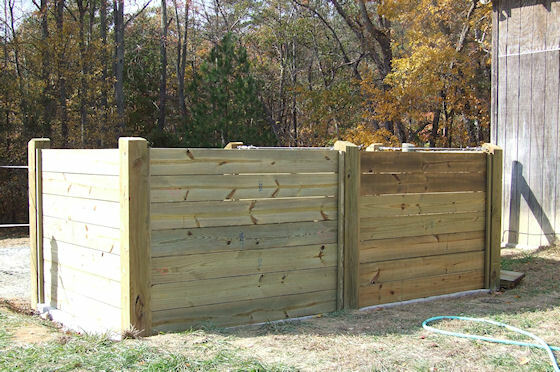 Unlike a neglected manure pile, a well-built and properly used composting bin will not pollute surface waters. If you produce more than you need, your neighbors might actually be eager to take the surplus off your hands. It's great for flower beds, planters, vegetable gardens, and lawns. 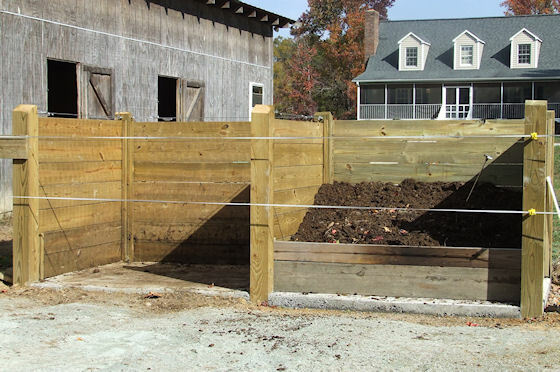 Because compost isn't unpleasant to be around, you can locate your compost bin right next to your barn door. No more hauling a heavy manure-filled wheelbarrow up a muddy hill to dump in the woods. Composting horse manure is easy; it pretty much takes care of itself if you just turn it once or twice a week (I use a front-loader on a compact tractor), and don't let it get too dry or too wet (a handful from the middle of the pile, when squeezed, should feel like a wrung-out washcloth with no dripping). In hot dry weather or in rainy weather, cover the contents of the bin with a tarp. Pretty much everything you need to know about composting, plus a very practical design for a manure compost bin (the same kind we use here at New Avalon, shown in the pictures below) you'll find at these web pages from Washington State University. Figure 1: These composting bins at New Avalon open into the paddock fence right by the barn door (the electric fence tapes on insulated handles keep nosey horses out while affording easy access when mucking stalls or turning piles). Each bin is wide enough to accept a front-loader's bucket - the bins are about six feet by six feet. I recommend building your bins in pairs; the easiest way to turn a pile efficiently is to simply move it from one bin to the other. Pour a 4" thick concrete pad for the bins, and don't neglect good footing in front of them for your tractor (here, packed stone screenings). Note the 3' probe thermometer in the pile at right. Monitoring the pile's temperature lets you know when it is time to turn it. Figure 2: And here's the view from outside the paddock. A well-built and well-used manure composting bin makes a fine neighbor. Turn your piles once or twice a week to aerate them and you'll have no odors and no flies. The easy way to turn a pile is to move it from one bin to the other with a front-end loader on your compact tractor.